The Royals are 79-64: Stop Blaming Ned Yost. What’s with y’all hating on Ned Yost? It’s as if some of us aren’t even aware there’s a 40-man roster full of options available to be the object of our blame. It’s all #Yosted, all the time. Maybe somewhere in the Tony-Tony- Buddy-Trey era, we all grew accustomed to miserable managers in Kansas City. Maybe my Royals fandom has blinded me to reality. Or maybe I’m just a dummy when it comes to managing in baseball. But from where I’m sitting, the Royals are in first place, and Ned Yost is doing a fine job managing this team. The more I interact with fans in person and online – both locally and across the nation – the more I realize there are certain “fans” out there who – no matter the year, the record, or the men in the dugout – will always, always, hate the manager. If you aren’t tracking with the type of “fan” I’m talking about, you might want to check the mirror. When Jeremy Guthrie got lit up for I-forget-how-many runs in 2.2 innings on Monday, there was a segment of fans who immediately jumped on Twitter to blame Ned Yost for leaving him in too long. They ignore the errors by Hosmer and the lazy throw by Infante and the unfortunate BABIP* luck the Tigers had rolling that game and they hunt for something to blame the manager about. And I’m sorry, too long!? Since when is 8 outs too long? Besides, if Hosmer and Infante make those plays, it’s possible the Royals were out of the third with no damage. Why is it far fetched to believe that Guthrie could still work his way out of it? * – BABIP (Batting Average on Balls in Play) measures the percentage of in-play balls are hits vs outs. It’s partially a “how lucky did they get with their contact” metric. No. The blame is on Guthrie and Hosmer and kind of Infante. Not Ned Yost. Also, God forbid we give credit to the Tigers when it is due. * – I should mention that the 9th was the only inning I saw. I know nothing of the Rajai Davis HR or the J.D. Martinez HR. I don’t even know how we got the two runs we did. We had our youth ministry kickoff event yesterday so I was busy having a shaving cream fight with a bunch of teenagers. Sometimes life serving Jesus really isn’t as difficult as we make it out to be. The score was Tigers 4, Royals 2. With no outs, Nori Aoki and Infante had nearly identical hits off Tigers closer Joe Nathan: slappers to the shortstop that they both beat out for infield singles. Infante, representing the tying run, was pulled for speedster Terrance Gore with Alex Gordon coming to the plate. A smart move from Yost. Alex got up 2-0, then hit an ultra high foul ball a country mile barely out of play. It was the best pitch Alex saw probably. The next pitch, Nathan missed his spot – catcher was lined up low and inside, but his pitch was 18 inches to the right, accidentally painting the outside corner instead. Alex took it for a called strike. Then, since he had accidentally thrown the perfect set up pitch, he went back to what he was trying to do originally and threw a nasty breaking ball down and inside. Gordon struck out. Which meant Salvador Perez was coming up with 1 out. Suddenly the double play is possible, but Yost still likes Salvy’s odds to hit in two runs. But Salvy – who has embarrassingly bad plate discipline these days – chased a breaking ball low and outside. Take a pitch for a change, Perez. That’s when Yost decided it might be best to get some speed on second instead of Aoki, so he sends Dyson out there to run for him. If the Royals do manage to score, it’s better to have Dyson in the outfield over Aoki for defense. Any good manager would make that switch anyway, why not benefit from Dyson’s wheels in the short term too? If Dyson and Gore can steal or start a hit-and-run, it eliminates the double play and keeps the game alive. Joe Nathan is already a complete train wreck out there mentally. Adding Dyson to the mix can only jack with his head more. A closer should never care about baserunners. His job is to mow down hitters, but Nathan was clearly wetting his pants out there worrying about Dyson. Besides, Yost is all about getting in guys’ domes. Nathan was clearly worried about Dyson. I’m not sure he paid any attention to Salvy at all, which is an added bonus for him at the plate. If Nathan stays worried about Dyson taking third base, then Salvy can just sit back and wait on a fastball. Any breaking ball would only add to Dyson’s chances to steal. I wonder if he had thrown home if Salvy would’ve had the green light when Dyson and Gore took off. A rattled pitcher is not an effective one, and Nathan was noticeably so. It’s a situation where the entire ballpark knows two things: he’s going, and there’s nothing anyone can do about it. All it takes is the right jump and Jarrod’s speed will take him the rest of the way, no problem. Then the unbelievable happened: Dyson bailed him out. Nathan pulled a slow inside move and Dyson bit on it, breaking for third, immediately realizing his mistake. In baseball circles, we call that a TOOTBLAN: Thrown-Out-On-The-Bases-Like-A-Nincompoop. In a 4-2 game with the tying run on first and winning run at the plate, Jarrod Dyson got picked off of second base, and I wish I could say he hasn’t become somewhat of a liability on the bases, but he has. He’s a weapon, for sure, and I love it when they pull the trigger on him – he just doesn’t seem to come with a safety. You can argue that Yost shouldn’t trust Dyson with such a task based on his recent history, and in retrospect it’s really easy to make that declaration. If you want to rip a managerial decision, fine. But don’t wait until after it fails to point the finger. How about this nugget: in the last 8 years, 46 baserunners have tried to steal on Joe Nathan, and only 2 of them were caught stealing. No pickoffs either. (Thanks, Rany.) That’s a 95.6% success rate. Suddenly it seems like a no brainer to run, and if Salvy grounds into a double play there to end the game or if Gore goes first to third on a single and can’t score, and we lose 4-3, we’ll all be throwing around the flip side of this convo wondering why Yost didn’t steal against Nathan when it’s so common! As I tweeted the moment Dyson got picked off, no one ought to be blaming Ned Yost for that pickoff. The fault is Dyson’s alone. From my perspective, Ned played it exactly right in the 9th, and Dyson crapped the bed. Sal struck out on another ball a foot low and outside to end the game. Just like that the threat was over. And wouldn’t you know it, but the world is all over Ned Yost again for getting cute trying to do more than was necessary to get runs across. To which I have to ask…have you seen the 2014 Royals?! Their offense is atrocious, yet they are one of the most efficient teams in baseball when it comes to getting baserunners across. It’s different every game – sometimes it’s a stolen base, or a hit-and-run, infield hits galore or a sacrifice – but somehow they have managed to manufacture runs when they’re needed. The Royals are where they are right now because of moved exactly like the one last night. The manager can only do so much. It’s up to the players to execute, and Jarrod Dyson failed to execute his role last night. 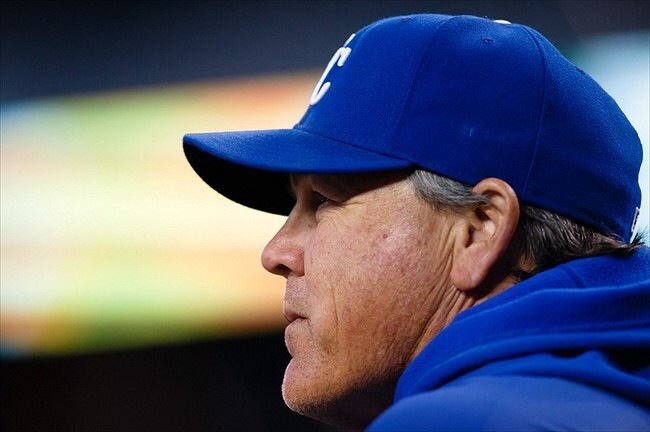 Has Ned Yost made mistakes? Absolutely. He’s fortunate to have the Triforce at his disposal because I don’t think he knows what he’s doing with anyone not named Herrera, Davis or Holland. Crow instead of Frazor. Scott Downs over anybody with at least one functional arm. There are times when he starts Raul Ibanez over Billy Butler and Josh Willlingham in the DH spot. When he makes a legitimately bonehead move, I’m happy to pounce on him with the rest of you. I’m not above dropping a #Yosted when the situation calls for it. He makes mistakes; all managers do. But when the Royals make the playoffs and Ned Yost wins AL Manager of the Year (which he will if they do), I don’t want to hear people saying he doesn’t deserve it. If you’re in that camp, I feel sorry for you. Maybe a trip to the playoffs is just what we all need to remind us that it’s entirely possible for a Royals manager to be capable of leading this team to success. And if that happens, I’m sure there will still be some ready to burn Kauffman to the ground at the next hiccup – when we lose in the ALDS/ALCS, likely – because these are “fans” who are more in love with hating the manager than in love with the Royals themselves. Blame Ned all you want, but he deserves much better. And so do the 2014 Kansas City Royals. Photo came from the fellas over at Kings of Kauffman. Couldn’t find the original source, but I’m betting it’s The Star. Previous Previous post: The Royals are 79-62. So let’s talk completely in hypotheticals about the final 3 weeks of the season. Next Next post: A Rambling post looking at AVG/OBP/SLG across a few MLB teams.